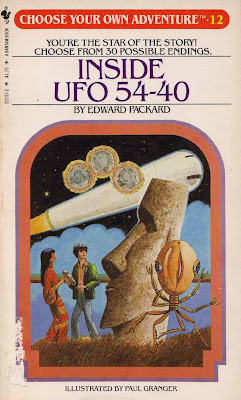 Now, hamhandedly amateurish illustrations were par for the Choose Your Own Adventure course, but since I've been old enough to know better I've been impressed that the only parts of this book cover without disturbing Freudian import are the lake and stars in the background. I mean, the juxtaposition of the rocket-powered phallic spaceship with the floating ball-thingies might be acceptible on its own, as would be the obvious case of statue envy experienced by the young man in the foreground. But the two of them combined with the claw-handed, um, spider creature suggest a badly neurotic view of human sexuality, even for someone who's made it past the developmental horrors awaiting the book's intended pre-pubescent readership. Sadly, this book holds you to storytelling choices within the realm of run-of-the-mill science fiction rather than plunging you into the psychosexual nightmare portended by the cover. On second thought I guess that's just as well, though, since if I were still a kid I'd rather choose an adventure that's not some kind of creepy mash-up of 2001: A Space Odyssey and Psycho. Well, I think it's good that you're reading on your own, Nate. Freud would have a hard time explaining why there are three ball-thingies with that rocket.